Wash Palak, drain and chop finely. Wash and soak dal for 10 to 15 mins. 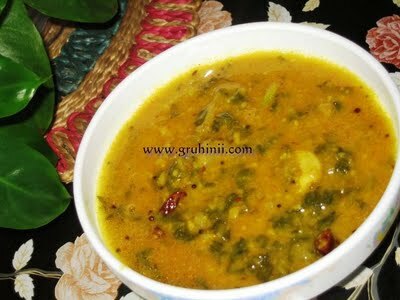 Take and pressure cooker and put Palak, chopped onions, green chillies, soaked dal, salt, chilli powder and haldi. Add 2 cups of water and cook for 4 to 5 whistles. After the pressure is gone, mash and mix the dal well. Add 2 table spoons of tamarind pulp and boil for 4 to 5 mins. and keep it aside. Heat a table spoon of oil in a pan. Add Rai, jeera and urad dal to it. 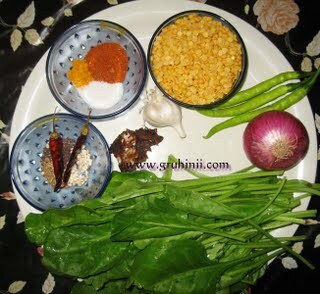 Let rai splutter, add red chiilies, garlic flakes (mashed) and curry leaves. Fry for few secs. 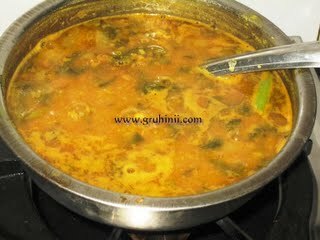 and add the thadka to the cooked dal. 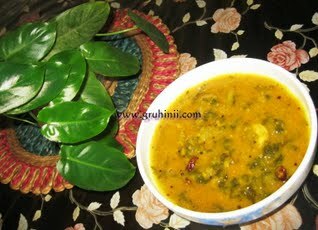 Palak dal is ready............... Serve with rotis, chapatis or rice. It is called Palakoora pappu in Andhra. Tip: Instead of adding only garlic flakes to the thadka, you can add ginger garlic paste which gives a special taste to the Dal.